I will be the first to say that my skin is far from perfect, but I like to think that I have healthy skin. This past year I realized that water is my new best friend. Not only has it allowed me to shed a couple of pounds but it keeps me well hydrated along with my face. From cutting out sodas to only drinking water (I have cheat days too lol), I can tell the difference in how well my face stays hydrated. So ladies and gents water is KEY!! I typically drink 64 ounces of water daily. So before going out shopping for skincare products make sure you get your daily dose of water. 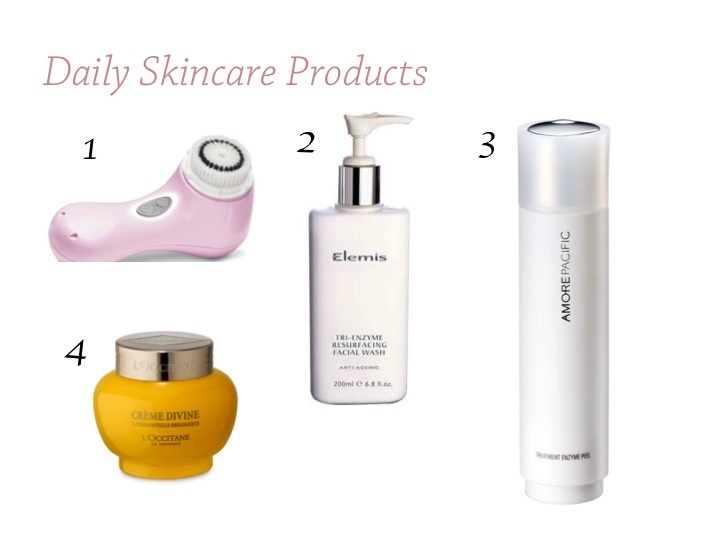 Here are a few items that I used to help keep my skin healthy, moisturized and smooth. 1. Clarisonic Mia 2 – This past year I purchased the Clarisonic Mia 2. One of the best purchases I have made in my life #truth. It’s amazing at buffing my skin and keeping it clean. 2. Elemis Tri-Enzyme Resurfacing Facial Wash – I purchase this face wash from Nordstrom. It is priced at $50 for the 6.8 fl oz bottle. I use this daily (morning and evening) with my clarisonic. The wash rids my face of dead skin cells leaving it flake-free and smooth. 3. Amorepacific’s Treatment Enzyme Peel – This botanical exfoliator is AMAZING! I use it 2-3 times a week; usually at night. It helps rid my skin of any blemishes and imperfections. I purchase this product from Sephora and it is priced at $60. 4. L’Occitane’s Divine Cream – This has been my go-to moisturizer for the past couple of months. I absolutely love this moisturizer. I purchased it from Nordstrom as well along with a small sample jar of the same moisturizer, facial cleanser and their divine eye creme. It was a package priced at $106. The moisturizer alone is priced at $106. I consider myself to have normal to dry skin. I tried samples of all products before actually purchasing these products (aside from the clarisonic). These products work well for my skin but with any product you are thinking of trying (even if recommended or suggested) you should first get samples to see how well the product works for you and if there are any skin reactions. What’s your skincare routine? Do you use any of the products above?